Planning my winter vacation to Belgium and the Netherlands, I expected a winter wonderland, complete with gingerbread style houses, winter markets, lots of snow, and of course, delicious food. As a food lover, my vacations are just as much about food as they are about art or history. Belgium and the Netherlands are known for their waffles, chocolate, beer, and fries, so naturally I was determined to try as much of these specialties as possible in my two weeks. The feast started in Brussels, and continued through Bruges, and Antwerp, finally ending in Amsterdam. 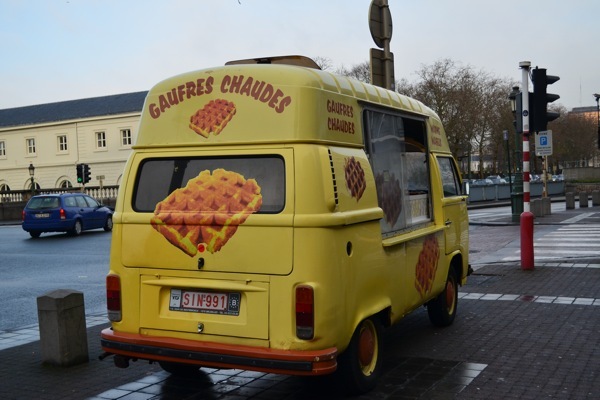 Our first encounter was with waffles, served from little window stores and food carts all over Belgium. The waffles were crisp, perfectly browned, and covered with a slight glaze from the grease of the well-used waffle maker. A perfect to-go food, they come plain, or with an assortment of toppings like whipped cream, chocolate, Nutella, fruit, and even maple syrup. As you bite into them, the crust crunches under your teeth, giving way to the soft doughy inside filled with tiny surprise sugar chunks scattered throughout. We enjoyed waffles quite frequently, but our host, a native Belgian, had trouble remembering the last time he ate one. Large servings of fries were available on seemingly every street corner, with sauces like mayo, ketchup, tartar sauce, and “American,” which tasted like McDonald’s Big Mac sauce (does it get more American than that?). 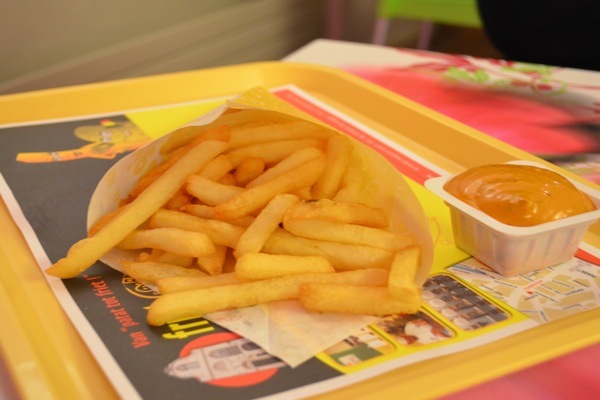 Fries are so popular there is even a fry museum in Bruges, where we discovered the history of the potato, the origins of the name “French fries,” and the evolution of fry carts. We even learned a recipe for real Belgian fries (see below!) – which are fried in beef tallow (known as blanc de boeuf). Then the chocolate! In every form imaginable – dark chocolate candies, pralines, truffles, and my personal favorite – hot chocolate. The hot chocolate is served as a large glass of warm milk, with a side of chocolate chips that must be stirred in with Whipped Cream on the side. 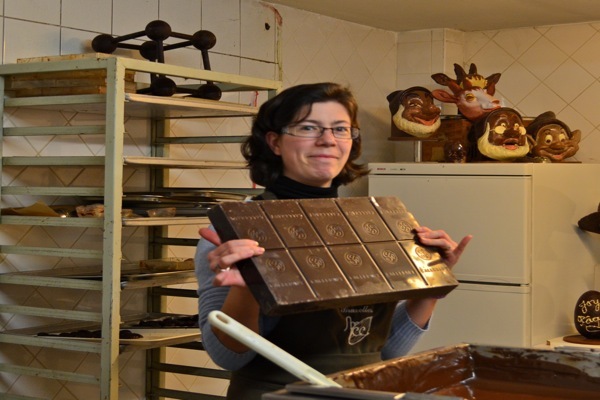 We visited the chocolate boutiques of Pierre Marcolini and Wittamer, and went to two chocolate museums. The Olmecs, Mayans, and Aztecs were the first to cultivate cocoa beans, which they used to make “Xocoatl”, a bitter chocolate beverage. Today, 70% of cocoa production comes from Africa, and 50% of the worlds cocoa consumers are in Europe. Almost every night ended in traditional Belgian/Dutch style, with a beer. Dark beers, light beers, amber beers, we tried them all. We went to a beer museum as well, where we learned that beer has been brewed since 6000 BC in ancient Mesopotamia. But, the use of hops for brewing was not introduced until 1364 by monks. 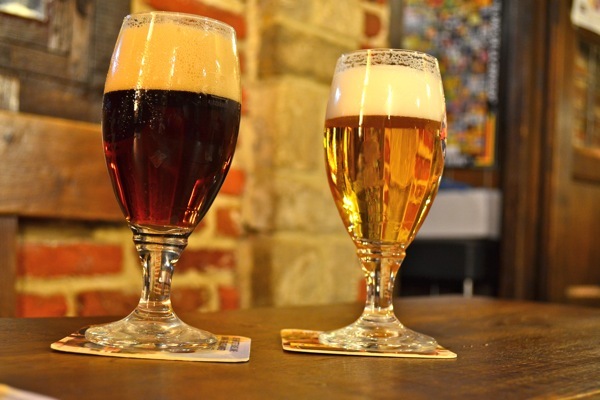 Beer is the second-most consumed beverage in the world, after tea. The edible tourist attractions of Belgium and the Netherlands far exceeded my expectations, but I was also pleasantly surprised by unexpected food trends, which I will share in my next post. Stay tuned! Serves: As many as you want, just use more potatoes. As a side, one to two large potatoes per person would be enough. Oil or beef tallow can be used. You should use enough oil to completely cover the fries, so the fries have room to move around. Recipe from the Frietmuseum in Bruges, Belgium. Peel the potatoes. Cut them in long slices (1/2 inch by 1/2 inch), rinse, and let dry. Precook the fries for 6 minutes in beef tallow heated to 270 – 280°F. Remove fries from beef tallow and let rest for 10 minutes. Cook fries a second time in tallow heated between 330 – 340°F, for 1.5 to 3 minutes. Drain fries and sprinkle with salt. Serve with you favorite sauce! I LOVE Belgium! I have not found comparable fries or waffles anywhere else, though I heard there is a Belgian frite stand somewhere in NYC and I passed a sugar waffle place (the American term for Liege style waffles) in Philly. If you are looking for Belgian Waffles in NYC my favorite is the Wafels & Dinges truck. Hint: Get their speculoos ice cream, if they have it.